Penicillin (PCN or pen) is a group of antibiotics which include penicillin G (intravenous use), penicillin V (oral use), procaine penicillin, and benzathine penicillin (intramuscular use). Penicillin antibiotics were among the first medications to be effective against many bacterial infections caused by staphylococci and streptococci. Penicillins are still widely used today, though many types of bacteria have developed resistance following extensive use. About 10% of people report that they are allergic to penicillin; however, up to 90% of this group may not actually be allergic. Serious allergies only occur in about 0.03%. All penicillins are β-lactam antibiotics. 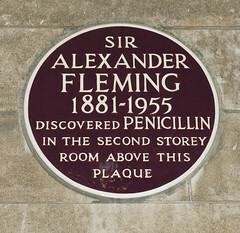 Penicillin was discovered in 1928 by Scottish scientist Alexander Fleming. People began using it to treat infections in 1942. There are several enhanced penicillin families which are effective against additional bacteria; these include the antistaphylococcal penicillins, aminopenicillins and the antipseudomonal penicillins. They are derived from Penicillium fungi.